Our preferred model of Yagi18 Aerial, which is available in A, B, K and E groups. These antennas have significantly better build quality than any X Beam aerial I`ve seen. For loft mounted installs we`d recommend the XB10A or XB10B over the Yagi18A or Yagi18B. The perfect aerial for reasonable (strong to medium) signal areas. Only available in wideband. The standard aerial is a 26 element but we also stock a shorter 18 element version, the DM18 Log. It is 12in shorter at only 2ft 6in long but has 1 to 2dB less gain than the standard DM Log. It is suitable for those requiring the smallest aerial in the strongest signal areas, but particularly since switchover it will work fine in many locations. For gain figures see test results. For dimensions see table. We recommend our grouped Yagi18 for poor areas of reception. Despite being significantly smaller (wind loading wise) than most “high gain” wideband aerials, the A group version will blow away any wideband antenna, and the B group outperforms every wideband I`ve ever tested. The version we stock has the best performance of all the Yagi18s on the market, it has a "balun", a cradle and a tilting clamp for poles up to 2in. Last, but by no means least, these Yagi18s are one of the sturdiest aerials on the market. In fact we sold one to a chap in Orkney and he reported it was still fine after a 110mph wind ! Many people replace Bacofoil aerials with these and are amazed at the difference in build quality, and you will be too....... I`ve always liked them, they`re one of my favourites. See Aerial Reports for the Yagi 18A, Yagi 18B, Yagi 18K and Yagi 18E. Examples of the major transmitters which can utilise a grouped Yagi18. Note that the Yagi18K is effectively a wideband after the 4G clearance (to 2013), i.e. it`s suitable for any transmitter, though a grouped Yagi18 (particualrly the 18A) will perform better. But it`s not just the fact it`s a “Bacofoil” aerial, it`s bleedin` gold for God`s sake ! Who would want one of these on their house ? We didn`t like having to send in postcards did we ? What we really wanted to do was pay through the nose to waste our time phoning up premium rate phone lines instead ! Yes Siree Boss Hogg ! Basically I have made a decision to only stock the best aerial of each type that anyone might require, and days of testing (by my good self) ensures I can say this with a certain amount of authority. Therefore the simple answer is that all of our aerials are the best ! In fact any aerial (or indeed any product) we stock will be a top notch product, because, to put it simply, if it wasn`t we wouldn`t stock it. Incidentally, unlike most suppliers, we endeavour to provide spares for aerials purchased from us. After much experimentation and research we have settled on seven types of aerial. See our advice for which aerial to use with which transmitter. There is another potential fly in the ointment with wideband aerials, the high power 4G transmissions from 2013, which, in some locations, may need filtering out. Well a B or K or (especially) A group aerial will avoid picking up a certain amount of the signal [which is from CH61 upwards] in the first place, and that may obviate the need for filters at some locations which may otherwise have needed them. Grouped aerials back in fashion ? Oh go on then, SLX/Labgear/Philex. If you`re on a wideband transmitter and really do need a high gain aerial (and most people don`t) we still recommend a high gain wideband over a T group despite the fact widebands are technically obsolete. This is because all T groups start dropping off in their gain curves in the mid high (channel) 50s to try and minimise 4G interference, though I`m sceptical if they`re much good at it….. But if you`re in a poor spot you need high gain in the high 50s ! So I`d go for a high gain wideband and if you do have 4G problems I`d get a filter, the latter will work better at preventing 4G interference anyway. This is a particularly good strategy whilst good quality filters are still available free from at800 ! ! If on a K group transmitter, and in a poor spot, we recommend our K group aerials. 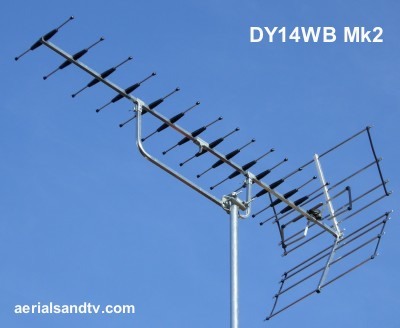 The DY14 Wideband is a “Double Yagi” type aerial and is well made, in fact these antennas have better build quality than the more common X Beam type aerials. The DY14WB has a "balun", a cradle and a tilting clamp for poles up to 2in. Size for size the DY14WB is the best high gain wideband I`ve ever come across, in fact its performance is even reasonable in the A and B groups, though obviously a decent group A aerial (or our XB16 group B) will have more gain in the relevant groups frequencies. The DY14 is a good choice for someone needing to fit a high gain wideband aerial in the loft because it`s only 5 ft long, which is pretty compact for an aerial with this amount of gain. Due to wind loading considerations if fitting to a 10ft pole we advise using the 2” variety. a “high gain” aerial (and most people don`t need one....) then this is the antenna I`d go for. Note that the DY14WB is only medium gain for A group transmitters (e.g. Crystal Palace & Rowridge). XB10 up at our test site. Note Emley Moor in the background. 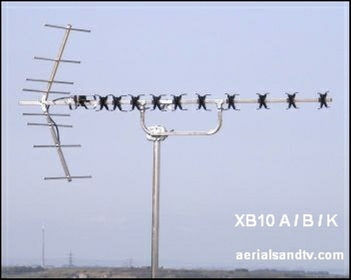 The XB10 A / B / K is an alternative to the equivalent Yagi18 for poor areas of reception. Although the XB10s have marginally more gain we normally recommend the grouped Yagi18s for outside installs because of their exceptional build quality. However, if you`re using the aerial in a loft it`s often a good idea to go for an XB10 because their smaller size enables more flexibility over where to install them within the roof space, furthermore they can also be end mounted (though we recommend cradle mounting the aerial for external installs). For an X Beam type these aerials are pretty strongly constructed and come with a cradle and tilting clamp for poles up to 2in. Examples of the major transmitters which can utilise an XB10A / B / K are listed below. Strong to medium signal areas should use a DM Log Periodic. Medium signal areas should use a Log 36. Weak reception areas should use a Yagi18A or an XB10A (the latter is particularly suitable for in loft installs). Poorest signal locations should use an XB16A. 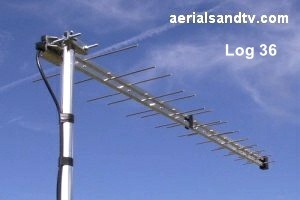 See our test results for these aerials. Weak reception areas should use a Yagi18B or an XB10B (the latter is particularly suitable for in loft installs) . Poorest signal locations should use an XB16B. Medium reception areas should use a Log 36. Weak reception areas should use a Yagi18E* or a DY14WB. Poorest signal locations should use an XB16E. Medium areas should use a Log 36. Weak reception areas should use a Yagi18E or a DY14WB. Poorest signal locations should use an XB16K. Strong to medium signal areas should use a DM Log. Medium areas should use a Log36. Poorest reception areas should use an XB22WB. The K group aerials we stock outperform the equivalent wideband up to CH55. Note, even the XB22WB does not give high gain at the bottom of the frequency range, there is no wideband aerial that will do this. Note. Wideband antennas have a relatively poor response at the bottom of the band, so why fit a “high gain” wideband on a K group transmitter ? If the site really is in a poor spot a high gain K group aerial should be used, e.g. an XB10K or even an XB16K. On the other hand if the signal is strong (or medium) then by definition it doesn`t need a “high gain” antenna anyway ! Under these circumstances a Log Periodic should be fitted instead. A group K aerial will help filter out the high power 4G transmissions. Note. Due to Wideband antennas poor response at the bottom of the band nobody should ever fit a “high gain” wideband on any A group transmitter. If the site is in a poor spot an A group aerial should be used. On the other hand if the signal is strong (or medium) then by definition it doesn`t need a “high gain” antenna anyway ! Under those circumstances a Log Periodic should be fitted instead. See “the wrong aerial for Crystal Palace” (or any A group transmitter). Lastly, an A group aerial will help filter out the high power 4G transmissions. For the full list of the 80 main digital transmitters see 6 MUX Transmitters. Finally in the weakest signal areas we would fit or sell the XB16 in group A, group B, group K and group E. These are all X Beam type antennas but they are still of reasonably strong construction, unlike some of that type, and all come with a cradle & tilting clamp (for poles up to 2in). The XB16s are the highest gain grouped aerials we have tested. For gain figures see test results For dimensions see table. See Aerial Reports for the XB16A XB16B XB16K XB16E XB22WB. If fitting an XB16 or XB22 on a 10ft pole we strongly advise using one of 2” diameter. 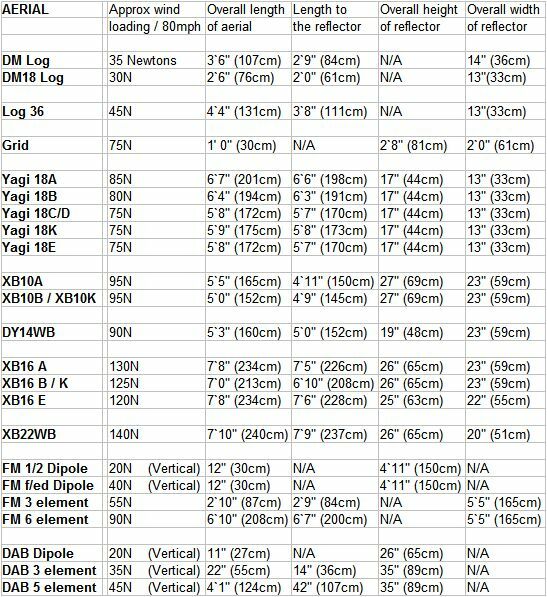 Below is a table with all the (approximate) dimensions of the antennas that we sell. Note that although 6ft, 7ft or indeed 8ft sounds big, once it`s on your roof it wouldn`t usually look that big ! The wind load figures are our own estimates, though we don`t think they`re that far out. It should be borne in mind that vertically polarising an aerial will increase its wind loading. We have given two figures for the length of each aerial, one is that from the first (front) element to the reflector and the other is the overall length of the boom. The XB10s can be end mounted if required, making them even more suitable for loft installations. However, for an outside install, we would not usually recommend end mounting an aerial of any appreciable size, as it will obviously put more strain/twisting forces on to the pole and its bracket. End mounting aerials can exert a very high torque and this was exceptionally annoying when I was undertaking aerial tests whilst there was wind about ! If end mounting an aerial (even more so if also using a cranked pole) consideration should be given to using saddles with the V bolts. End mounted Tri Booms (see test of economy Tri Boom), exert even more force because of their large wind loading, a MUX Magician Tri Boom is around 150N (at 80mph), that`s significantly higher than even a large XB16 so be warned. In fact a Yagi 18K has more gain than a TriBoom and half the windloading (approx 75N) ! Log Periodics must (should ?) be end mounted, but as can be seen from the table their wind loading is relatively low so it isn`t usually a problem. The dimensions for the reflector(s) are for the whole (double) unit. Some of our customers need to transport the aerials after delivery ( particularly to avoid carriage supplements to NW Scotland and Northern Ireland ! ) so below we have a table showing the approximate sizes of the boxes which the aerials come in. These dimensions are also used by customers arranging their own collection, which, to some far flung addresses is cheaper than us organising the delivery through TNT. XB16 A / B / K aerial at our test site. 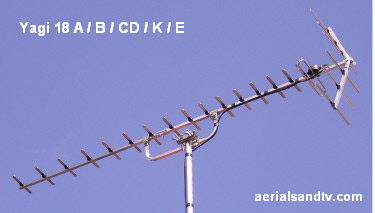 Do not confuse this aerial with smaller 10 bay A / B / K group X beam type aerials. * See "covering all eventualities"
We recommend Log Periodics for good or medium reception areas as they have even gain characteristics across the band, decent multi path rejection, low wind loading, efficient impulse noise suppression and (some) are physically strong in construction. Unfortunately they are only available in wideband and have relatively low gain, though the Log36 is better in this respect and is suitable for medium or medium/poor areas. The Log is one of the best antennas, particularly for digital (Freeview), which is why we and the broadcast authorities, use them wherever possible, see why choose a Log Periodic ? If there is such a thing as a “universal aerial” (which there isn`t, but bear with me....) this is it. When it comes to aerial choice, remember the basic rule (which the broadcast authorities also use...), if you can use a Log, use a Log ! 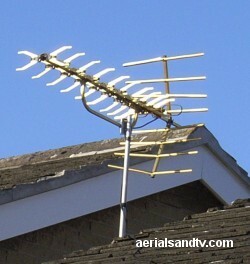 The perfect aerial for medium signal areas (also see Yagi 18K). In most cases (90% of installations ?) you can`t go far wrong with a Log36 (or Yagi 18K) TV aerial, particularly if you need a T group / wideband aerial. If you`re still short of gain then, and only then, try adding a variable gain (capable of being turned down to a low level) mast head amp. NOTE : The version sold from Jun 2018 on, is, unfortunately, pre-wired. In order to improve the waterproofing of the F conn joint we supply 1ft of self amalg tape. The Log36 is specially tuned to help reduce interference from the mobile phone signals transmitted just above the TV band since 2013 (though it must be said a filter is generally the most effective way to combat that problem). Log36s are only available in T group / wideband (c/w clamp [non tilt] for poles up to 2in). See wiring up a Log36. We recommend that all Log Periodic aerials are installed tilted up at the front end (outside installs). For gain figures see these test results. For dimensions see this table. Yagi18B up at our test site. Note Emley Moor in the background. The DM Log`s 6 inch trailing lead (c/w rain proof slide over cover) makes it even more suitable as a touring aerial. A full length lead is then attached to this “tail” (link). We can shorten the boxes for the XB16s (to 48” /1.2m) and FM3s (to 59"/1.5m) if necessary. In addition, for those in poor signal areas, Mendip and Sandy will only have one MUX out of the A group. A group B aerial will help filter out the high power 4G transmissions. The strong (and repairable) construction of the DM Log together with its relatively compact size also make it perfect for use in boats and caravans as well as on houses. In my opinion there is no aerial more well suited to boats and caravans than this one. 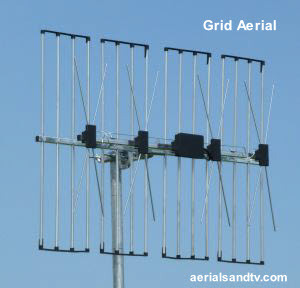 The Grid is a specialist aerial most often used these days when trying to reduce the signal from a transmitter directly behind the antenna. In addition, because of its wide but short construction, it can also be useful for installations requiring an antenna of that shape. For its performance see its gain curve. For the aerial`s dimensions see table. Due to the 700MHz clearance this article (and, in fact wideband aerials generally) is, or will be, a bit obsolete. Excluding the rather esoteric MUXES 7 & 8 (which are due to be switched off between 2020 and 2022 anyway) the whole TV band will be K group, i.e. it will only go up to CH48. In the interim I happen to know for a fact (because I`ve tested it a few times) that the Yagi18K works well up to CH60 anyway so will cover all transmissions both before and after. Whether to use a wideband / T group aerial or not is a source of much debate. The CAI and the BBC recommend the installation of wideband aerials, or they did, they`re not so sure any more ! For most installs, i.e. those in strong or medium signal strength areas (90% of homes, or more ? ), we agree with them and advise the installation of one or other of the Log Periodics, which are wideband or T group anyway. If your transmitter is a wideband we would (obviously) also advise fitting a wideband even if you live in a marginal signal area. However if you live in a poor reception area, and your transmitter is grouped, many of those in the aerial industry diverge quite markedly from this blanket wideband advice. You must bear in mind that a grouped antenna can give you significantly more signal than a wideband. In fact, if you are on an A group transmitter * , there is no such thing as a high gain wideband (or T group) aerial ! Reading this customer aerial report (and the others) is very educational on this point. To a lesser extent this high gain wideband inferiority also applies to B group and K group transmitters. So what is the explanation for this inconsistency ? Well, being a cynic I think it`s yet another example of the modern trend to “pass the buck”.It`s easy for “the powers that be” to recommend widebands because they cover themselves if (and it is an if...) they ever decide to start transmitting out of band in the future. But it isn`t them who have to put up with a potentially weaker signal. Whatever the truth of the matter I`d have thought that people should be more bothered about getting a reliable digital signal now, rather than risking a less reliable signal for what may, or may not, happen at some time in the future. * After the 700MHz clearance many more transmitters will be A group. Anyway, back to Benchmarked aerials. But, and it`s a significant but, just because an aerial is not Benchmarked does not mean that it is in any way inferior. Quite apart from the fact that there are four different levels of Benchmarking (so you have to be specific about what you mean be Benchmarked aerial) most grouped variants of the same model of aerial are not Benchmarked whilst the wideband version is Benchmarked ! Bearing in mind that over its designed for frequencies the grouped model will perform better than the wideband (sometimes by a large margin) this seems somewhat bizarre. With a bit of background information the explanation is not hard to comprehend. It costs the aerial manufacturers up to one thousand pounds to put an aerial through the Benchmarking process so they will only do this for products which they will sell a fair number of and/or make a fair bit of money on. When you realise that widebands outsell grouped aerials by a large margin (most aerial suppliers - to the public - and all DIY shops only sell widebands) it all becomes clear. In short, a version (usually the wideband) of all our recommended aerials is Benchmarked. But, as far as I`m concerned, it`s irrelevant. I`ve done my own tests thanks. DM Log at only 2ft 6in, it has slightly less gain but is just as well made and (our version) comes with a heavy duty tilting clamp. The XB22WB is no longer available, we recommend the DY14WB Mk2 in its place. When using the DM log for a touring aerial (caravans / boats) it`s going to get battered about but, fortunately, it`s all metal so is easily repaired. We recommend regularly checking that all the elements are a firm “tight” fit because loose fitting elements on a Log Periodic can affect its performance (unlike on a Yagi where they don`t, in fact, have to make any electrical contact with the boom at all) so try to ensure the screws are all tight. If you accidentally strip the threads simply fit a slightly larger self tapper, in gauge NOT length, particularly in the boom where the cable runs, you do not want to screw right through the cable or you may not get any signal at all (see cable testing on a Log) ! Also check the element “over clips” are tight, use a large pair of pliers to keep the latter in firm contact with the booms. The DM Log can be “opened out” quite easily at the clamp end to facilitate access to the lower element screws and or clips. However, satellite dishes aren`t usually mounted on the end of long poles, which greatly increase the force on the bracket and the wall (or chimney) that it`s mounted on. Obviously the angle of the wind onto the dish is very significant, a southerly (i.e. onto the front of the dish) being the worst case though there is a theory that a “side on” wind can make the dish perform as an aerofoil ! Apparently there is no significant difference in wind load between a solid and perforated dish at wind speeds above 50mph due to the turbulence created around each hole. I would say, all things considered, the Yagi18s are probably the best aerials we sell. * Excluding MUXES 7 & 8, which are due to be switched off between 2020 and 2022 anyway.